Our mudguards are thicker and stronger then the competition and 100% made in the USA. 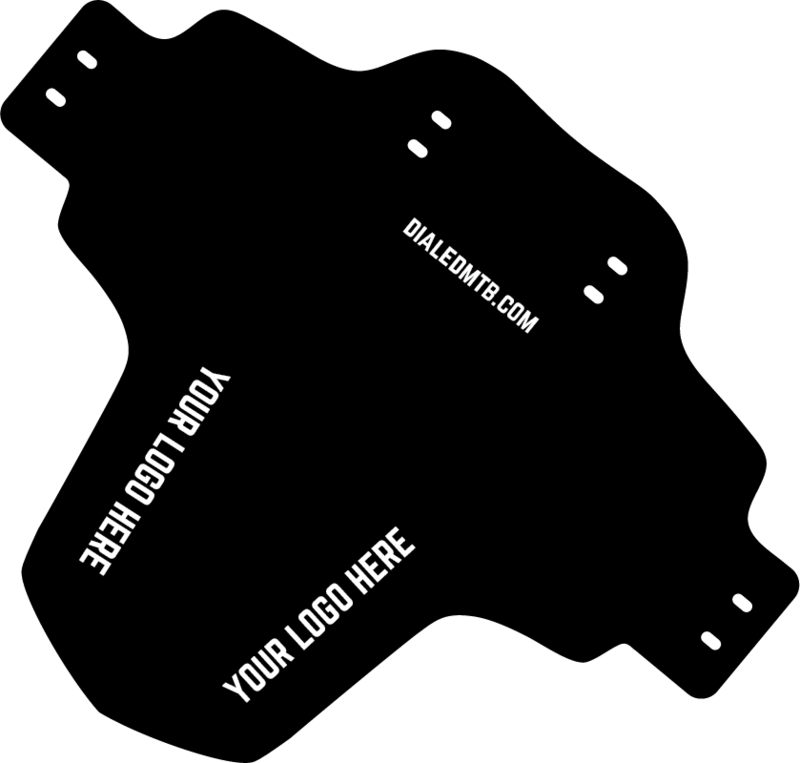 Let us help promote your local bike shop, bike park, race, team or trail crew. DialedMtb Custom Mudguards are made from 50% post-consumable plastics; CNCed and hand-screenprinted, from our home in the Great Northwest. One color print available in 10 colors on black; minimum order 25 at $11ea., 2 week turnaround time. Also available in 9 additional base colors; minimum order 50 at $10ea., 4 week turn around time, please email us to make arrangements for this service info@dialedmtb.com. 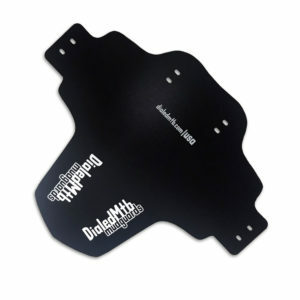 DialedMtb Mudguards are thicker and stronger then the competition and 100% made in the USA. Let us help promote your local bike shop, bike park, race, team or trail crew. These guards are great! They’re a lot thicker than other mudguards so they don’t get droopy if the mud starts to pile on, and the screen printing is top notch and durable! These are awesome! They are well-designed so they protect you from flying mud without compromising tire clearance. They’re thick enough that they last forever and hold their shape well. Plus they add some flair to your bike with cool designs! I’ve used mudguards from four or five other brands, and this is true: once you go Dialed, you don’t go back. These things are WAY sturdier than the other guards out there. I’ve had other guards that dent if you just look at them wrong. I’ve even had rocks punch through other guards and come flying up into my face. Not with these. They simply hold up and keep taking the punches. No joke, I’m about to move the same guard from two years ago onto my newest bike. Show me another guard that lasts three seasons and still looks new! Oh, and the custom graphics are dope! These guards are Fantastic! I have been sporting these for years now and I have to say they are extremely durable. I have had a few not because they break, but because of the stylin graphics Dialed comes up with. Gotta keep my bling rolling. DialedMtb provides excellent customer service as well. Their bike cleaning kits are a one stop shop and will have everything you need to polish up your whip. The chain lubes never fail and they have various lubes for various conditions. DialedMtb adds new products all the time. I keep up on it to see what is next. Get a mudguard. Get a kit and whip that whip.